September was PCOS (Polycystic Ovarian Syndrome) Awareness Month, so it is only fitting to do an episode centered around this condition. 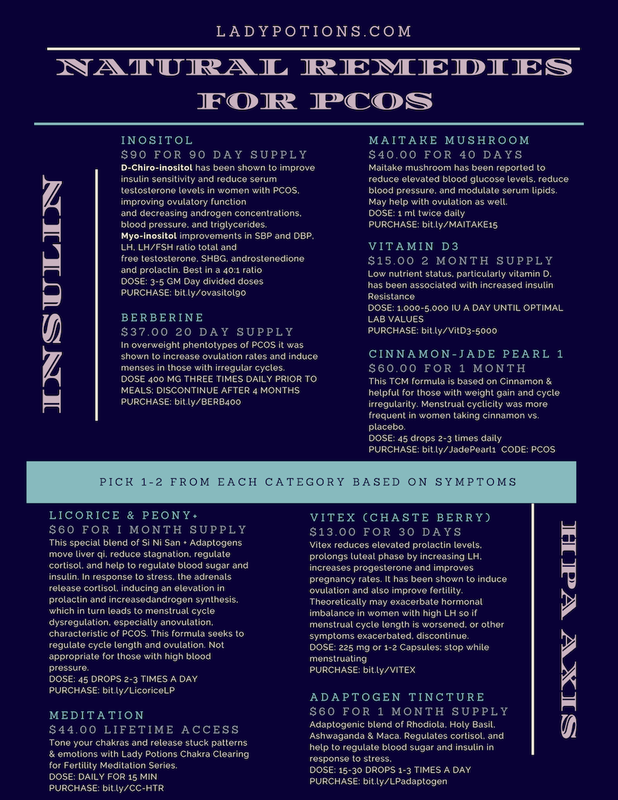 One in 10 American women, which is somewhere around five million women, suffer from symptoms on the PCOS spectrum. Today, we talk about what exactly PCOS is and the root causes, how the diagnosis occurs, the five Categories of Treatment, some myths surrounding it, and how you can go about reversing your PCOS in 9-12 months naturally. To share your own fertility story, please comment below. I look forward to connecting with you, as you are what this podcast is all about. [2:12] Hillary shares her acceptance into the Women’s Functional and Integrative Training Program, offered by Dr. Aviva Romm. This is a huge honor, and Dr. Romm has been one of Hillary’s trusted teachers and an inspiration for shaking things up in the medical world and applying wisdom and evidence-based medicine. [2:42] Just because something has been traditionally used, doesn’t mean it’s a good idea for us. Hillary gives examples of pharmaceutical debacles from the 1950s up until recently. [6:52] Hillary recounts her experience with Accutane and the severe side effects. [8:28] It’s important to know what you are taking, the potential side effects, and whether it is traditional or alternative treatment. [10:46] How we take care of our bodies in the 12 months prior to falling pregnant has a huge impact on the next two generations. For the first time ever in the United States, children are being born with a lower life expectancy than their parents. And if we are sending down copies two generations at a time of our genes and we’re not teaching people how to ensure that these genes don’t trigger or mutate into various health issues, then we’re not actually practicing preventative medicine. [12:11] In the U.S., one in 10 American women will have a diagnosis of PCOS at some point in their life, which is the equivalent of five million women. There are about 10 different types that can present and are not what a majority of healthcare physicians think of as PCOS. Usually, they consider it to be someone that’s overweight, with high testosterone, and a 2:1 LH: FSH ratio, and having cysts show on an ultrasound around the ovaries. But in reality, there are so many different presentations that it’s more like a spectrum with women being affected to different degrees causing different symptoms and severities. [13:43] Although 85% of women affected with PCOS can reverse it naturally, a lot of physicians don’t look at it like it’s reversible. [16:44] Polycystic Ovarian Syndrome was previously considered a gynecological problem, diagnosed on the presence of polycystic ovarian cysts by ultrasound. Now, it’s actually recognized as a complex endocrine disorder with multiple possible causes and clinical manifestations. Only one of those actually yields polycystic ovaries on an ultrasound. [18:23] When women begin to understand that it was likely a predisposition was from their mother in utero, based on changes in the food supply, they can have a little more grace and compassion with themselves as well as motivation to try and stop it for the next generation. [19:23] How is it diagnosed and what are the symptoms? PCOS is a clinical diagnosis and it is primarily diagnosed based on having some or all of the classic symptoms and having other medical conditions being ruled out. While testing the blood on day three, looking at the ratio between LH and FSH, estrogen and testosterone, can certainly be one of the ways that we diagnose PCOS. [20:31] Traditionally, PCOS was thought to cause weight gain and abnormal hair growth from the excess testosterone, which does happen in one phenotype, but not all. [21:30] Symptoms of Polycystic Ovarian Syndrome can include any of the following: infertility, irregular periods, lapses between periods for months at a time without being pregnant or breastfeeding, acne, weight gain, unwanted facial hair, hair thinning or hair loss, which oftentimes looks like male pattern baldness in PCOS, and then less commonly, you can have darkening of the skin in the armpits, the back of the neck or the groin. The other aspect to consider is that women with PCOS are also more likely to suffer from depression and anxiety, or they have eating disorders, particularly binge eating. [23:31] You are 20 to 40% more likely to experience a miscarriage due to the insulin resistance and the hormonal problems that it creates. Oftentimes, there is estrogen dominance and there’s not enough progesterone to actually hold a healthy pregnancy. I do see a lot of chemical pregnancies or early stage miscarriages in women that maybe didn't even know that they had PCOS. But then after we do a little bit of deeper digging we find that they have these symptoms, and then it’s really important to control for blood sugar dysregulation as well as the hormones when they’d go to get pregnant again. Diet becomes super important in those women. [28:00] You have to understand, the key is getting your blood sugar under control first, and the insulin resistance under control, before you start experimenting with the fasting. In terms of the science behind the diet, low inflammatory, low glycemic Mediterranean diet or a modified ancestral diet, meaning Paleo with lots of vegetables in it, not just all meat, has been the one that has been shown in the evidence to have the most dramatic effect on PCOS. And the bottom line is that most patients with PCOS will respond to a diet that is no more than 80 grams of carbohydrates a day and has about 60 to 90 grams of protein, and the rest being good fat. [29:59] Vitamin D has been associated with insulin resistance in low amounts. Having your vitamin D tested to see where you’re at is super easy and then supplementing depending on how low you are, with 2,000 to 5,000 units a day, and then re-testing again in 30 to 60 days to see if it’s making a difference on the levels themselves can be really helpful. One of the supplements that Hillary uses when encountering a woman with diagnosed or suspected PCOS is inositol. Inositol comes in a couple of different forms and a lot of the studies that have been done actually show that it’s advantageous to have a combination of Myo-inositol with D-chiro-inositol, at a ratio of 40:1 of Myo-inositol to D-chiro-inositol. The reason for that is, it’s naturally occurring in the body in that ratio. With the Myo-inositol you want to take up to 4 grams a day and the D-chiro you can go up to 1,200 milligrams a day. [33:19] Another herb or supplement that is used in blood sugar regulation is cinnamon and we use this all the time in Chinese medicine. 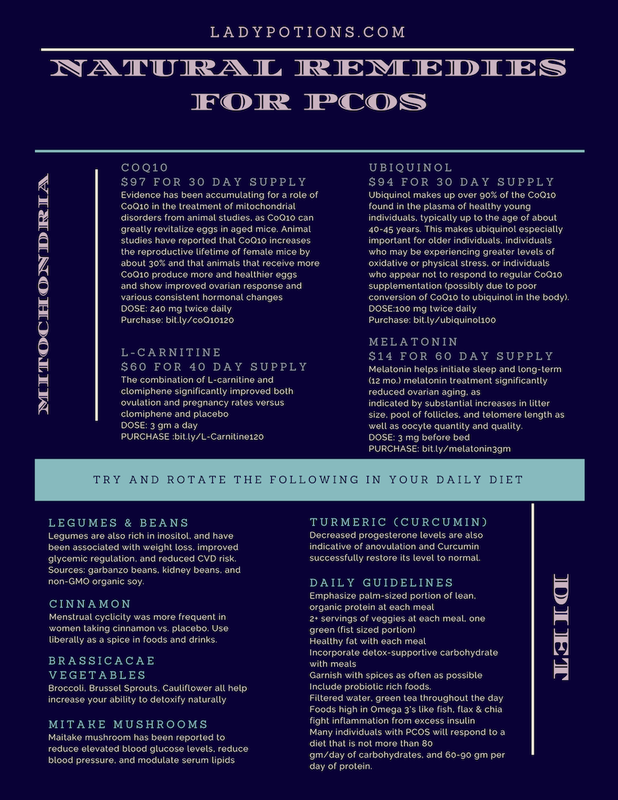 In fact, the main formula by which most others are based on for treating PCOS is derived from is Gui Zhi Fu Ling Wan. [34:03] The second category to consider when treating PCOS is HPA Axis Dysregulation. Now, HPA Axis Dysregulation is the hypothalamus, pituitary, and adrenal axis. One of the biggest things that you can do for yourself is getting adequate amounts of sleep. The most restful hours of sleep for fertility are actually between 9:00 PM and 11:00 PM. [40:43] Adaptogens are one of the greatest weapons we have, as they regulate cortisol and change our perception of stress. Adaptogens are ginseng, and things like ginseng, Rhodiola, Ashwagandha, licorice, Dang Shen or known as Codonopsis from Chinese medicine, milky oats, Schisandra, also known as Wu Wei Zi in Chinese medicine. Oftentimes if you pick up an adrenal axis formula or some are even named HPA Axis Formula, you will find that it’s a combination of these herbs. [42:22] The only adaptogen that has been studied specifically for PCOS is licorice. Licorice tends to raise the blood pressure, so if you already have high blood pressure, this is one that you would want to avoid. And in terms of ginseng, even though it’s a great adaptogen, it’s very hot energetically. If you have a lot of symptoms of heat, you’re sweating at night, maybe you’re having hot flashes with it during the day as well. You’ve got red itchy skin, loose urgent bowls, ginseng is not the one for you, you would want something more cooling like Dang Shen. Dang Shen is often substituted for ginseng or Ren Shen. [46:04] Not only do adaptogens regulate the cortisol, but they also help to regulate blood sugar and insulin. [48:59] If you aren’t properly eliminating those toxins in your bowel, they circulate back around to your liver which only lessens your liver’s ability to get rid of excess hormones. Making sure that you’re having daily bowel movements and detoxifying to the best of your ability is super important. On the flipside, if the bowels are too loose and you’re seeing undigested food, you’re not absorbing everything that you should be from your food. [52:46] The other aspect of gut health is leaky gut and that is caused by all kinds of pharmaceuticals, over-the-counter medications, antibiotics, improper gut flora, improper diet, and any major abdominal surgeries, including C-sections. You want to find out if there are any inflammatory food triggers — anything that is causing thinning or permeability of the gut. If you’re intolerant to gluten or dairy and you’re eating it every day, this can build so much inflammation that it eventually thins the lining of the gut, causing toxins to leak into the bloodstream. [56:41] If you do have histamine intolerance, if you think you’re having an immune response to sperm or you suspect that, that’s part of your infertility, you could include strains in your probiotic that actually help degrade histamine and an overactive immune response, which would be Bifidobacterium infantis (this is found in breast milk), Bifidobacterium longum, and Lactobacillus plantarum. These are helpful as well as soil-based organisms, meaning prebiotics that act as a food source for the good strains of probiotics you are using, as these can help to lower the immune system response. [58:09] The other category that needs to be considered when you’re cleaning up PCOS and trying to reverse it is environmental toxins and detoxification overload. Oftentimes, this is happening through your skin and beauty products, as well as your foods that are genetically modified and cause what are called xenoestrogens — bad estrogens — to dock in your hormonal receptors. These are huge causes of dysregulation, as are things like BPA, which is found in the lining of cans, so all those cans of tuna and LaCroix that you’ve been consuming thinking that you’re eating healthy, the BPA inside can be detrimental to your estrogen/testosterone balance. [1:00:57] The last category: Energy production and mitochondrial function. If you are someone that has insomnia and or fatigue, this category is for you. There’s been evidence that’s been accumulating for the role of CoQ10 in the treatment of mitochondrial disorders and infertility for some time now.